I am by far one of the least domestic women around. I am a terrible cook. Most of my meals are takeout or microwaved. I am not ashamed to admit it! A man who can whip together a decent dinner is at the top of my partner wish list. Haha. 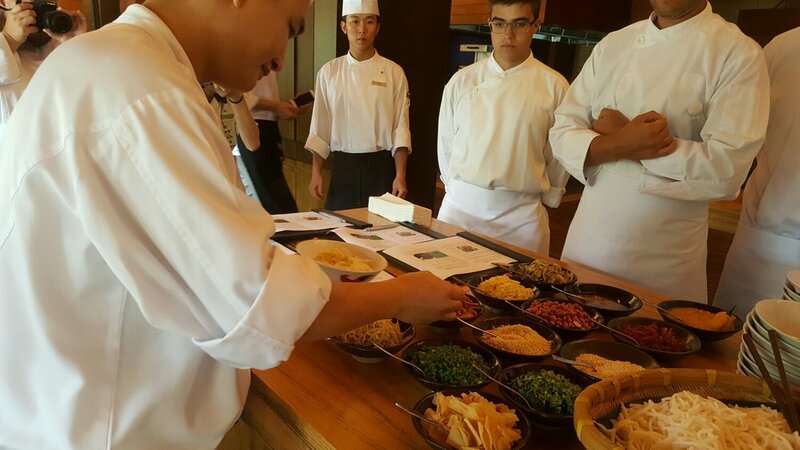 So, of course, when we were offered the opportunity to learn a simple, traditional Chinese recipe with a five star chef I jumped at the chance. Bao Luo Rice Noodle Soup is a staple in Hainan households and food stalls around South China. Bao Luo is almost idiot proof and easily customized. The dish consist of blanched Rice noodles, served in stock made from beef or chicken and flavored with soy sauce, sesame oil, white pepper and a healthy dose of garlic. The noodles are ladled with broth into soup bowls. My favorite part of this meal is choosing the toppings. I like a hearty soup so I added beef, pork, chicken, chopped mustard greens, bamboo shoots, scallions and a bit of crushed yellow chili for spice. Viola. Easy, peasy lemon squeezy! This sponsored post is written in collaboration with the Renaissance Sanya Resort and Spa, Starwood Hotels. All opinions of the stay and my experience in the hotel are my own.